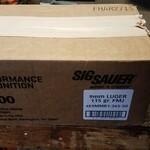 Description: This subcompact, .380 ACP caliber from Sig Sauer is a smart looking, small handgun built with the same accuracy and reliability as large frame Sigs. With an overall length of just 5.5", a height of 3.96", and weight of just under a pound, this P238 is the ultimate firepower in an all metal frame concealed pistol. The P238 is built on a black hard coat anodized alloy beavertail style frame with fluted polymer or rosewood grips. 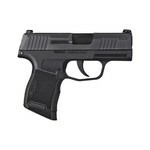 The stainless steel slide features the popular Sig Sauer slide serrations and improves overall performance and accuracy. The Siglite Night Sights are removable and adjustable for windage. It is SA only with thumb safety. 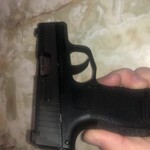 This Sig Sauer P238 is in very good condition. 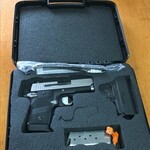 It comes with one 6 round magazine, X-Grip 7 round magazine, lockable hard case, De Santis pocket holster and Sig Sauer pocket wallet holster. 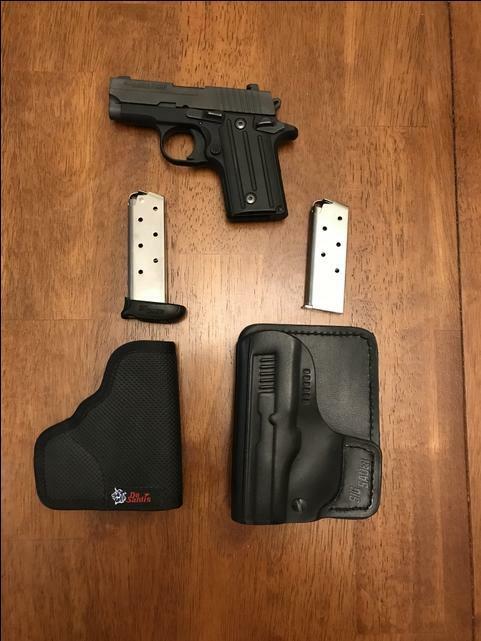 Must be 21 years of age and eligible to purchase a hand gun in Kansas. Please message with any questions. No trades at this time.